Inconsolable crying along with a fever warrants a call to the doctor. Parents tend to overtreat kids under 6 with anti-fever medications such as acetaminophen and ibuprofen, giving too much too often and putting their children at risk for liver damage, according to a survey conducted at Johns Hopkins School of Medicine. They’re also likely to take their babies unnecessarily to the emergency room for fevers, exposing them to germs in the hospital, says Michael T. Crocetti, M.D., assistant professor of pediatrics at Johns Hopkins Children’s Center. “For babies older than 3 months, temperature is not necessarily the most important thing,” says Crocetti. “How they’re acting is just as crucial.” Symptoms that are usually more concerning than a fever alone include having fewer than three wet diapers in 24 hours or not waking up regularly to eat. Another mistake parents make is overbundling feverish babies, which can push body temperature up too high. Instead, dress your child lightly or in a diaper only, Crocetti says. Age Temperature (rectal) Action Up to 1 month Higher than 100.4° F The baby should be seen by a doctor within a few hours, either at the office or the emergency room (ER). 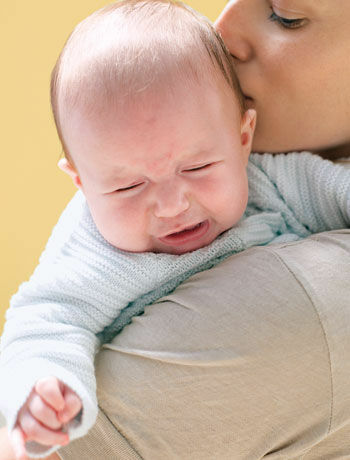 Fever in newborns may be a sign of a serious infection that requires antibiotics. 1–3 months Higher than 100.4° F Call the pediatrician—watching and waiting, an office visit or a trip to the ER are all options depending on your baby’s other symptoms. 3 months to 3 years Higher than 102° F Call the doctor if the fever lasts for more than 48 hours or if there are other worrisome symptoms. If he’s still uncomfortable, give acetaminophen or ibuprofen, following your doc’s dosing instructions carefully. Never give aspirin to a child.